Drive south on NC 12 and almost every car you'll see will either have fishing pole racks on the front, surfboards strapped on top, or will be towing kiteboarding or windsurfing equipment. Ideal wind and water conditions coupled with mild temperatures 10 months a year draw folks from as far as Canada and Europe. Fishing and water sports rule on Hatteras Island, but there's also plenty of lounging and relaxing to be had. The great thing about a Hatteras vacation is that you can "do it all" or you can "do nothing at all" - either is just fine on this laid back island! Fishing is a way of life on Hatteras Island, NC. Whether you cast a line from the shore, from a pier, or from a charter boat, you're likely to bring home something for dinner. If you're new to fishing, stop by a local tackle shop or pier - they can get you started. Most charter boat captains also welcome novices and families. 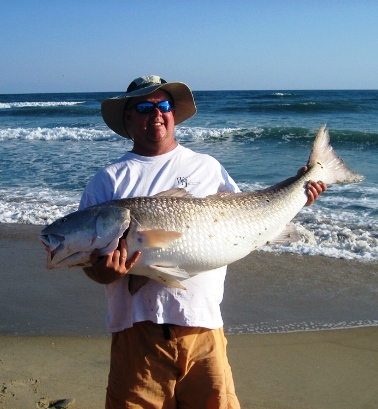 Whether you fish competitively or just for fun, it is a wonderful way to spend your Outer Banks vacation. 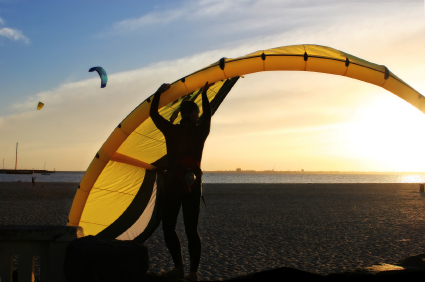 In recent years, Hatteras Island has been distinguished as one of the best places to kiteboard in the world! REAL Kiteboarding recently opened their flagship store in Waves and offers a variety of classes from beginner to advanced. Classes cover everything from learning to rig to learning to pop and jump. Group lessons or private instruction is available. Windsurfing has long been one of the most popular activities on Hatteras Island. Canadian Hole, located just north of Buxton, is known as one of the best windsurfing spots around. Besides the necessary water and wind, Canadian Hole also offers a large parking lot, bath house and plenty of space for spectators. Surfing , kayaking and paddleboarding are also hugely popular on Hatteras Island. Lessons and rentals are available at numerous local shops. If wind and water aren't for you, no worries! You'll find mini golf, family activities, spas, Hatteras Island restaurants, shopping and more. You can even take a trail ride through the maritime forest then ride onto the beach with Equine Adventures. While on your Hatteras Island vacation, be sure to check out the following attractions and activities! 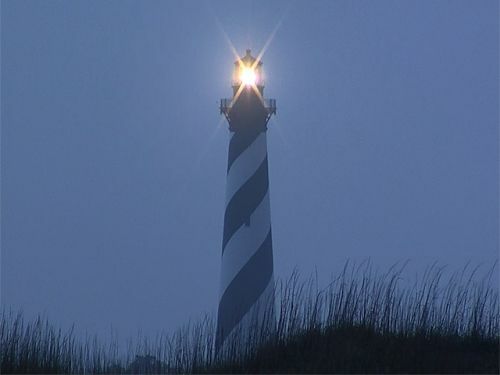 Cape Hatteras Light Station. Located in the village of Buxton, Cape Hatteras Light Station is by far the most widely recognized symbol of the Outer Banks. Moved from its original location in 1999, this lighthouse is open for climbing from Good Friday to Columbus Day for a small fee. Climbing to the top is the equivalent of walking up a 12 story building! However, the view from the top is stunning. Chicomacomico Lifesaving Station. One of the seven original lifesaving stations on the Outer Banks, see a shipwreck exhibit or one of the weekly lifesaving re-enactments. From 1874 until 1954, U.S. Coast Guard lifesaving crews stationed in this beautiful wooden building battled the shoals and surf of Hatteras Island to rescue hundreds of shipwrecked sailors. Inside are exhibits on the lifesaving service. N.C. Route 12 Rodanthe. Frisco Native American Museum and Natural History Center.Located in Frisco, NC, this museum housed in a 100+ year old building provides a rich history of Native American way of life. You'll see some fascinating artifacts from the Native Americans who inhabited Hatteras long before English settlers. Graveyard of the Atlantic Museum. This museum is dedicated to preserving the history of the ships that have fallen victim to the rocky shores of the North Carolina coast. See shipwreck artifacts and learn why the notorious shoreline around Hatteras Island is so dangerous to sea vessels. Pea Island National Wildlife Refuge. A protected wildlife sanctuary, this is a popular stopover for migrating waterfowl, and a terrific place to see a variety of interesting plants and wildlife. There is a self-guiding tour with information on the species that can be found each season. More than 260 species of birds have been spotted in the 5,915-acre refuge that extends along the Outer Banks from Oregon Inlet to Rodanthe. Take an easy hike around the North Pond Trail and Salt Flats Trail to see some incredible wildlife and scenery. In total, the hike is approximately 4 miles long.